The Langebaan Lagoon is one of the world’s critical conservation areas for birds. Guano is a valuable fertilizer and is collected from bird islands. 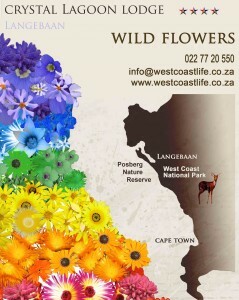 West Coast Birding: The bird route is located between the West Coast National Park and the Lower Berg River Wetlands. Ideal uncontaminated views of numerous bird species are visible on this spectacular route. Over 50% of coastal birds breed on the islands near Saldanha Bay. When birding in the West Coast National Park, a birder can often see about 80 to over 100 species in a day. Comparable numbers can be found to the north in the Lower Berg River Wetlands. Many coastal birds can be seen in S.A. Saldanha Reserve, Jacob’s Bay and the Cape Columbine Reserve at Paternoster. Oystercatchers: Rare, threatened species that only occurs on our Southern African coast. When our beaches are buzzing with the summer tourist season, the oystercatcher lays two eggs in a scrape in the sand above the high water mark, where people like to walk; this endangers the oystercatcher’s existence even more. Lambert’s Bay Bird Island: Any devoted bird lover should take a trip to Lambert’s Bay Bird Island. Watch them take off and fly around. The breeding season for the Cape Gannet is usually between August – September. Roof top engagement celebrations overlooking Langebaan Lagoon! Would you like to receive more updated news or be informed about special events in the West Coast? Our site will publish your pictures around. West Coast Life is licensed under a Creative Commons Attribution-Noncommercial-No Derivative Works 2.5 South Africa License.